Don’t get me wrong, I love eating out, but I insist on cooking at home at least five days a week. 1 | Don’t veg out! Many home cooks I teach tend to leave out the vegetables in their meals when time is limited and they’re under the gun. I always have one of my four top vegetables- spinach, broccoli, carrots, or sweet potato- on hand to fill out my dinner plate. Steam a whole head of broccoli at once to a tender crisp texture and bag the left-overs for stir-fries, salads or top with cheese and pop under the broiler for a minute. Do-ahead mashed potatoes and steamed carrots are great or just stir in thinly sliced spinach since it cooks quickly. I take my package of raw chicken breasts or cutlets, put them in freezer bags with my marinade of choice and freeze them. I usually whip up a few different, simple marinades and portion out the chicken, so I have several nights dinners on hand. This way I can take out one of the bags before I leave for work in the morning and it safely defrosts in the fridge while I am out and about. When I get home and it’s time to make dinner, I simply toss the contents in a baking dish and cook. While the chicken cooks, I reheat some of my pre-steamed veggies and voila!- dinner is done and I didn’t have to mix a thing or wait for the chicken to marinate. I freeze a lot of my pre-measured ingredients in snack bags and label them with sharpies. Most recipes call for just 1-2 tablespoons of tomato paste, so it’s a great way to store left-overs from the can you just opened. Measure out orange juice concentrate that’s perfect for flavoring stir fries, baked goods, and salad dressings. Freeze pre-measured lemon, orange, and grapefruit zest to add zing with no fat. Pre-cooked brown rice survives the freezer. Just defrost on the counter and add a little chicken or beef broth to reheat. Cooked, grilled, shredded chicken will save a step with burritos, casseroles, and soups. If you’re chopping onions, garlic, carrots and celery for soup one night, make double and bag it for tomorrow’s dinner. There are hundreds of recipes including soups Hearty Ham and Vegetable Soup or Tuna Fish Casserole, that use all of these chopped vegetables or a combination of them. Make your own super healthy, incredibly flavorful chicken broth, and freeze it in quart sized containers. Don’t forget to have staples on hand that don’t need to be refrigerated. I have my trusty and true favorites that I restock weekly in my cabinets. My staples include: low-fat, low sodium chicken and beef broth, Italain breadcrumbs, canned whole peeled tomatoes, reduced sodium soy sauce, whole grain pasta, brown rice and taco shells. Having these goodies on hand means I can make hundreds of recipes by just adding ground meat and a vegetable. Want to clear out your pantry and make a home-cooked meal at the same time? Check out these clever ideas for a Pantry Supper. Trying to figure out what to do with leftovers? Learn more from Kathy Maister’s Do More with Leftover Chicken. 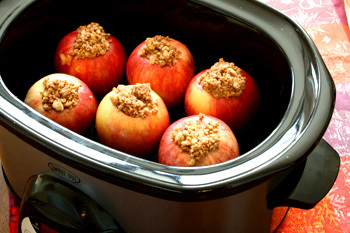 Want to try slow-cooked meals, but don’t have a crock-pot? Try my stove-top favorites like Chipotle Chicken or Grilled Jalapeno Flank Steak.